The two participants who tragically lost their lives during Sunday's Ironman African Championship at Nelson Mandela Bay’s Hobie Beach have been named. "Mooi loop Leon Stanvliet. Ons gaan jou baie mis maat (Go well. We are going to miss you a lot)," wrote one Facebook friend on Stanvliet's profile picture. "Leon... RIP. You were a good man," wrote another. "RIP" and "Heartfelt condolences to family and friends of the deceased," wrote others on Facebook. "A post-mortem will be conducted to determine the exact cause of death," Naidu confirmed. 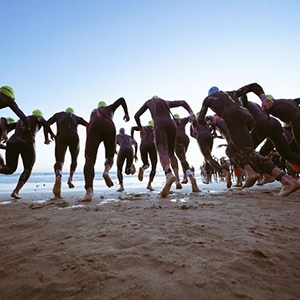 "Both athletes required medical attention during the swim portion of Sunday’s race and were transported to a nearby hospital where they were treated. "Our condolences go out to the family and friends of both athletes, whom we will continue to support. "We are working with the local authorities to gather all details and will continue to do everything possible to provide a safe environment for our athletes. In respect of each family’s privacy, we will have no further comment at this time."